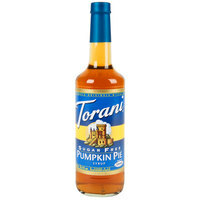 Indulge your patrons with the rich, creamy flavor of pumpkin pie filling blended into their coffees and specialty drinks with this Torani 750mL sugar free pumpkin pie flavoring syrup! Crafted with hints of cinnamon, nutmeg, and ginger, this flavorful syrup embodies the spirit of autumn and the warmth of holiday cheer. And, it's sweetened with Splenda brand sweetener, which offers the taste of real sugar without the calories. This pumpkin pie syrup tastes like autumn in a bottle. The syrup is perfect for pumpkin spiced lattes without all the calories of the sugared counterpart. A great sugar free product for the seasonal drinks. Cannot tell it is sugar free by taste. Great for our customers who have to watch their sugars. If you love Pumpkin Pie / Spice the. You will most def love this Pumpkin Pie flavoring syrup. We throw a couple pumps in our coffee every morning and it’s just a Pumpkin Pie explosion in your mouth. Get your customers in the fall mood with this sugar-free option that won't have them missing out on the taste just the sugar. Great in coffees and lattes. I need more stars for this product. This is the BEST flavor. Bring on fall as now we can enjoy all of our favorite drinks sugar free. This syrup is okay. It's way less popular than the sugar free pumpkin spice, so I don't think I'll buy it again. We have so few people asking for sugar free pumpkin that it's really only necessary to have one kind. Pumpkin Lattes are a favorite of mine. You can generally find them in the fall but the rest of the year they are ghosts seldom seem. With this rich sugar free flavoring I can indulge year round! I like to order the sugar free syrups to add to my coffee or hot chocolate. I find the Torani syrups in general to be pretty good. However, this pumpkin pie flavor is a little underwhelming. It's very heavy on the nutmeg. It's the only sugar free pumpkin syrup there is, so you don't have much of a choice! It's good for what it is -- don't expect Pumpkin Spice Latte quality here, but it's an adequate Pumpkin Latte and doesn't have any sugar. You only drink it if you can't have the sugar, and then in that situation, it's better then being left out of the pumpkin beverage menu altogether! We use a lot of this pumpkin pie flavoring syrup in the fall, it's perfect for our sugar free customers. It's a great flavor for fall. If you like pumpkin pie this syrup is a must try !! We also love that it is sugar free , so it has all the flavor without the guilt !! This is a nice flavorful option for non sugar syrup and works to flavor not only drinks but also yogurt or even cookies as it does taste like the spices in pumpkin pie! This is a new flavor of sugar free Torani syrup that I've never seen before, so I'm trying it out because it's that time of year and I love pumpkin pie! The taste is great and it is sugar free. The perfect combination to cut calories without sacrificing flavor. Torani products are the best and at a good price. This is great. Can't even tell it is sugar free. We use them for pancake seasoning and it doesn't take much to get a pumpkin flavor. This taste just like pumpkin pie which is very popular when fall and winter come around here in Ohio, I think we will be going through a lot of this here within the next month or so. A seasonal favorite in a sugar free form! Honestly, I wish more coffee shops would start stocking this. It's just as tasty and easy to use as the full-sugar versions! Torani is a trusted brand and an all time favorite. I love that Webstaurantstore has all the flavors available for such a great price! My favorites are the caramel, vanilla, and pumpkin spice in the fall! This is the best value I've found on this brand of syrups. They are even in glass bottles, rather than plastic you usually find on other sites. I'm doing the State of Slim diet, and this syrup (plus the pumpkin pie spice also on this site), are life savers for the Greek yogurt and pumpkin breakfasts. Lots of flavor, but no calories, and not a strong artificial sweetener taste (which I think Splenda is good for). I haven't used it for my Soda Stream waters yet, but I think it would be really nice in coffee. I have one client that requested this as a special order and I'm so happy I accommodated him. This is a great product and will likely become a part of the regular menu. Tastes just like the sugar version. Goes great in cold brew coffee! I tasted spice but not really pumpkin pie. It wasn't horrible. I'm though not a personal fan of many things splenda. The product is as stated and Torani is a popular brand. I actually like this better than pumpkin spice but it is all personal preference. Getting them together and marketing them together seems to work well for our store. Fall has arrived, and with it the desire to drink warm pumpkin flavored beverages! This has lots of flavor and stand up well in coffee. Went through a bottle in a 2 days, great taste and price! Well, it is fall. And even though my protein drinks come in a pumpkin flavor, I love this syrup. It adds a boost to coffee, custard, and if you haven't tried it in butterscotch pudding, you are missing out. Spiced just right. Lovely flavor. This sf pumpkin spice is a bit different in Torani's sugar sweetened version. The flavor is not as strong but it's not bad either. With the sugar full all was needed with a dash of cream. Now this sugar free version I I either have to use a pumpkin spice creamer or add more spices from my cabinet. The sugar free pumpkin pie flavoring we use for coffee. It makes a great latte with protein shakes and coffee. First we brew the coffee and add the pumpkin pie flavoring. then make a vanilla protein shake with very little water and ice cube in blender. Whip it for a long time then put it on top of the coffee. Great low calorie latte. Sugar Free Pumpkin Pie is a huge seller! Tastes just like Pumpkin Pie and is a great product for those who cannot have sugar. We have a house specialty drink, Pumpkin Chai and the customer's love it. Love all Torani syrups very authentic taste. The pumpkin pie is to die for. During the holiday season it is a hit. Very festive. A go to during this time of year. I am on a low carb diet and have been craving a pumpkin spice latte and then I found this amazing syrup. It is seriously so good and tastes exactly like pumpkin pie. I am sad I only ordered one bottle because it is going to go fast! I love the flavors of fall so I was excited to see torani pumpkin pie syrup in sugar free. I immediately used it in a cup of coffee. I definitely cannot find this product anywhere near me. I love make pumpkin pie smoothies with this product.plus the fact that it's sugar free is a bonus. The bottle lasts a long time. loBe it. Disappointed :( I love pumpkin flavored lattes and I thought this syrup would add the "fall flavor" of pumpkin that I was looking for....unfortunately, I found it to be very weak in flavor and one of the worst Torani syrups I have ever tried. Thank you for your review! We're sorry to hear you didn't like this flavor. Feel free to look at all the different Coffee Flavoring Syrups we sell to find a flavor you'll love! Although I peruse many syrup sellers, I had not seen this syrup offered sugar free before. I quickly submitted my order for this holiday favorite. As with all my orders from WEBstaurant, the product was shipped in a very timely manner and packaged to meet the current winter conditions. I appreciate such fine service from this company at very reasonable prices! Torani Sugar Free Pumpkin Pie Flavoring Syrup tastes better than it smells. The first time I smelled it, I thought for a second that the syrup had actually gone bad somehow. Further smelling suggested that this "bad" smell was supposed to be...custard-like, as in pumpkin pie. The spices are the most notable taste in this syrup, but overall I found it rather bland. In the future I would just use actual pumpkin pie spices rather than this syrup, especially for coffee drinks. Thanks for your review! You may be interested in DaVinci Gourmet Pumpkin Pie Classic Coffee Flavoring Syrup, item 711SYPMKNPIE. This great tasting syrup is popular among our customers. This Torani Sugar Free Pumpkin Syrup is a great add in to our pumpkin cheesecake smoothie. This syrup gives it just the boost we were looking for.